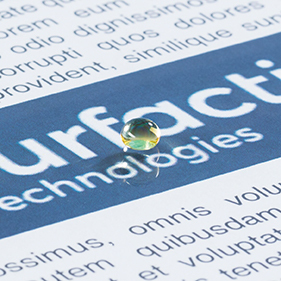 At Surfactis Technologies, we are currently working on the development of transparent superhydrophobic coatings that will impart water-repellent, anti-soiling or self-cleaning properties to transparent surfaces. The technical challenge this represents must in no way be underestimated. No product on the market today is capable of delivering an easy-to-apply superhydrophobic coating that imparts water repellency without altering the substrate’s optical properties. And yet so many industries are crying out for a solution of this kind, be it for ophthalmic lenses, solar lenses, helmet visors, outdoor cameras or windshields to name but a few. The superhydrophobic solution we are developing will give end-users the unprecedented opportunity to enjoy outdoor leisure activities to the full without being distracted by rain or snow. It will also be of particular interest to professionals who need to use technical equipment (high pressure water jets, cameras, etc.) in harsh conditions, such as water or mud. Our easy-to-apply coating is a spray-and-go solution. The superhydrophobic effect it imparts in no way alters the substrate’s visible or IR light transmission properties (haze <1%), whilst delivering outstanding anti-wetting performance. The superhydrophobic coating is obtained by using positive surface texturing functionalized with a hydrophobic molecule. Our proprietary formulation combines the perfect particle size with a high-performance mix of solvents and adjuvants. It is designed to be applied as a homogeneous layer on a wide range of transparent materials (glass, plastic). Superhydrophobic and superoleophobic coatings have numerous applications across a variety of domains, including transparent optical coatings, as their ultra-low surface energy dramatically reduces the adhesion forces of any contaminant or liquid whilst leaving the surface’s appearance unchanged. Our efforts to develop a fully transparent superhydrophobic coating are currently ongoing.